A regular, permanent resident and occasional, erratic fall migrant. The Canada Jay was uncommon during the Minnesota Breeding Bird Atlas (MNBBA). Found across Canada from Labrador to British Columbia and southward in mountainous regions and forests of western North America to New Mexico and California. In the midwestern and northeastern United States, the species is restricted to the northern regions. Highest densities found in patches of northern Alberta, British Columbia, Labrador, Manitoba, and Ontario (Figure 1). Permanent resident, irruptive movements southward have been noted in some years. Omnivorous, consuming arthropods, fruit, carrion, nestlings, and fungi. Open nest, low to moderate height and usually placed in a coniferous tree near the trunk. Breeding distribution and relative abundance of the Canada Jay in North America based on the federal Breeding Bird Survey, 2011–2015 (Sauer et al. 2017). Roberts (1932) reported the Canada Jay as a “common summer resident in the more northern evergreen forests of the state.” He cited breeding activity at Mille Lacs (full-fledged young), Itasca Park (family parties, parents and young), and eastern Marshall County (young with parents), and reported several observations from St. Louis County, including the only documented nest with eggs. In St. Louis County he noted early nesting behavior: “February 22, 1898, building nest, snow still on the ground.” Other observations spanned from February to August; the later reports were primarily of family groups traveling together. Years later, Green and Janssen (1975) described the Canada Jay’s distribution as primarily in the northeastern and north-central portions of the state. They reported confirmed nesting from 4 counties: Cook, Itasca, Lake of the Woods, and St. Louis. A few years later, Janssen (1987) highlighted the fall irruptive movements of Canada Jays southward in Minnesota, such as one described by Roberts (1932) in 1929–1930, when many wandered south and stayed throughout the winter in the Twin Cities area. Janssen reported additional movements, which occurred in 1965–66, 1974, 1976–77, and 1984, and one of the largest movements, in 1986. Janssen reported confirmed nesting since 1970 in 11 counties, including 7 that had not been previously reported. They were in Aitkin, Beltrami, Cass, Clearwater, Cook, Crow Wing, Hubbard, Itasca, Koochiching, Lake of the Woods, and St. Louis Counties. Hertzel and Janssen (1998) then added nesting in Lake County since 1970, confirming nesting in all of the counties in the northeast and north-central regions. The Minnesota Biological Survey (MBS) identified 369 breeding season locations of the Canada Jay during their intensive county surveys (Minnesota Department of Natural Resources 2016). These locations substantiated the breeding locations previously identified in northeastern and north-central Minnesota. They also verified locations in northern Carlton County, west to northeastern Becker and Marshall Counties, and several locations in Roseau County. The distribution of the MBS’s breeding season locations corresponded well with the limits of the southern and western ranges in Minnesota outlined by both Green and Janssen (1975) and Janssen (1987). Results of the MNBBA totaled 734 records. The overall distribution incorporated the same breeding range as noted in the previous accounts (Figure 2). Canada Jays were identified in 8.1% (385/4,737) of all surveyed blocks and in 8.3% (195/2,337) of the priority blocks (Figure 3; Table 1). Confirmed nesting was reported from 96 blocks, with especially high concentrations from the northern tier of counties ranging from Lake of the Woods County to Cook County. Confirmed observations were all of fledged young or young being fed by adults. The confirmed nesting in southeastern Roseau County represented the first nesting record for that county. One probable nesting observation was made of a pair in southern Crow Wing County. This region has extensive black spruce and tamarack bog habitat. The species was not observed in Carlton County, which is adjacent to the northwestern-most county in Wisconsin where it has been confirmed nesting (Cutright et al. 2006). Strickland and Ouellet (2011), in their review of the Canada Jay in North America, suggested only minor changes in its historical distribution. They cited retractions northward in the species’ range in Alberta, Michigan, Algonquin Park in Ontario, Quebec, and Wisconsin. Land clearing in Alberta in the early 1900s was mentioned as a cause. Roberts (1932) identified “two full-fledged young” at Mille Lacs, which may represent the most southerly observation of potential nesting in Minnesota. Unfortunately, the location is vague. Both Aitkin and Crow Wing Counties, where nesting has been confirmed, abut Mille Lacs Lake. As noted earlier, the areas west and north of Mille Lacs Lake have suitable bog habitat for this species. It is logical to conclude that there may have been some breeding range contractions in Minnesota in the southern and western margins, but documentation is lacking. Breeding distribution of the Canada Jay in Minnesota based on the Breeding Bird Atlas (2009 – 2013). Summary statistics of observations by breeding status category for the Canada Jay in Minnesota based on all blocks (each 5 km x 5 km) surveyed during the Breeding Bird Atlas (2009-2013). Summary statistics for the Canada Jay observations by breeding status category for all blocks and priority blocks (each 5 km x 5 km) surveyed during the Minnesota Breeding Bird Atlas (2009-2013). Canada Jays strongly favor coniferous and mixed coniferous-deciduous forests where spruce is typically present (Strickland and Ouellet 2011). The National Forest Bird (NFB) Monitoring Program recorded 687 breeding detections from 2001 to 2010 in national forests in Minnesota and Wisconsin (Niemi et al. 2016). NFB Monitoring Program data indicated a strong preference for mature black spruce–tamarack and jack pine forest cover types, but the species was detected frequently in regenerating conifers, mixed swamp conifers (commonly with white cedar and black ash), aspen-birch, and aspen-spruce fir habitats (Figure 4). The primary use of spruce-tamarack cover types over cedar was also noted by Cutright et al. (2006) in northern Wisconsin, and by Strickland and Ouellet (2011) in Ontario. MNBBA data from point counts identified bogs and upland coniferous forests as primary habitats where Canada Jays were counted (Figure 5). Little is known about landscape-level effects, such as patch size, on the breeding habitat of the Canada Jay. Ibarzabal and Deroschers (2004) reported that edges were used by Canada Jays and that their predation of nests of smaller songbirds could have an overall negative impact on these species. Nest site data for Minnesota were limited. The largest data set on nest sites is from Algonquin Provincial Park, Ontario. Strickland and Ouellet (2011) reported that 652 nests were located from 1969 to 2010! The distribution of these nests was 57% in black spruce, 28% in balsam fir, and 14% in white spruce. Detailed nest observations described a bulky nest of twigs, bark, and moss often held together with cocoons of tent caterpillars or spider webs. Typical breeding habitat of the Canada Jay in Minnesota (© Gerald J. Niemi). Habitat profile for the Canada Jay based on habitats within 200 m of point counts where the species was present during the Minnesota Breeding Bird Atlas (2009-2013). The most recent estimate of the Canada Jay population in North America was 26 million breeding adults by Partners in Flight (Partners in Flight 2017). Environment Canada (2011) arrived at a more conservative but wider estimate in Canada ranging from 5 million to 50 million. Partners in Flight (2017) also estimated a Minnesota population of 30,000 individuals. No estimates of the Canada Jay population in Minnesota were attempted using the MNBBA data because there were too few observations and high uncertainty in estimates. Population trends for the Canada Jay based on the federal Breeding Bird Survey (BBS) were unreliable for estimating a trend for Minnesota, Michigan, or Wisconsin as well as the Boreal Hardwood Transition Region. The latter area encompasses a broad region including the northern portions of all these states, plus areas of southern Canada. Population trends were reliable for routes completed in Manitoba, Ontario, all of Canada, and survey-wide. Trends for these regions all indicated a stable population from 1966 to 2015. The largest sample representing 750 routes was the survey-wide area (Figure 6). Partners in Flight estimated a North American population decline of the Canada Jay of 19% from 1970 to 2014 (Rosenberg et al. 2016). This is likely due to significantly declining populations in Alberta and the Atlantic Northern Forest region. The only region where populations were significantly increasing was in Quebec (Sauer et al. 2017). The overall population trend in the Chippewa and Superior National Forests was estimated to be nonsignificant or stable from 1995 to 2016, based on annual sampling of 63 forest stands (Figure 7). The trends in both national forests showed a pattern increasing from 1995 to 2008 but declining from 2008 to 2016. The density of breeding Canada Jays is difficult to measure because they lack a characteristic “territorial song.” They do have a wide variety of vocalizations and tend to be relatively noisy and curious about human intruders. During the NFB Monitoring Program, the overall mean detected in the Chippewa and Superior National Forests was 0.5 and 0.9 pairs per 40 ha, respectively. Densities at Algonquin Park in Ontario were estimated as 0.3 territories per 40 ha, and in Manitoba as 0.6 territories per 40 ha (Strickland and Ouellet 2011). Data from Christmas Bird Counts analyzed for 1959 to 1988 indicated a significantly increasing number observed survey-wide and in Ontario, but significantly declining populations were detected in Colorado, Maine, and Quebec. Numbers observed in Minnesota increased by 3.6 percent per year based on 31 Christmas Bird Counts (Sauer et al. 1996). Although new analyses of these data have not been completed, Menebroeker et al. (2016) analyzed five suitable Christmas Bird Counts from northern Wisconsin and found a significantly declining count of Canada Jays beginning in the early 1990s. 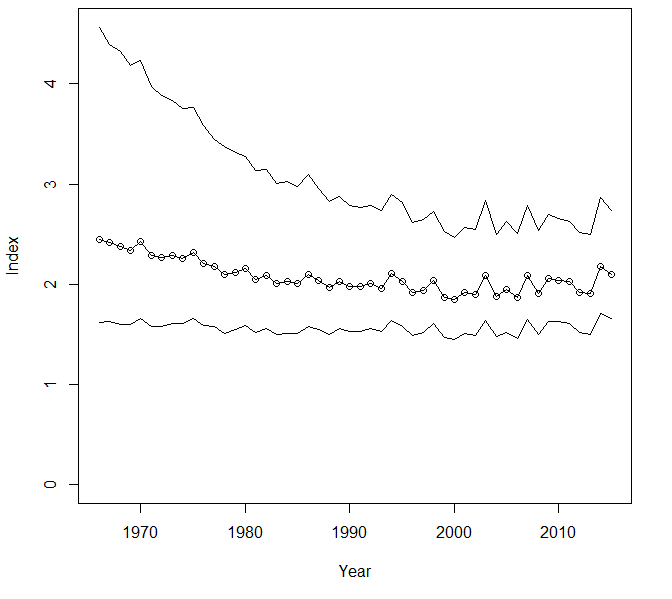 Breeding population trend for the Canada Jay survey-wide in North America for 1966-2015 based on the federal Breeding Bird Survey (Sauer et al. 2017). 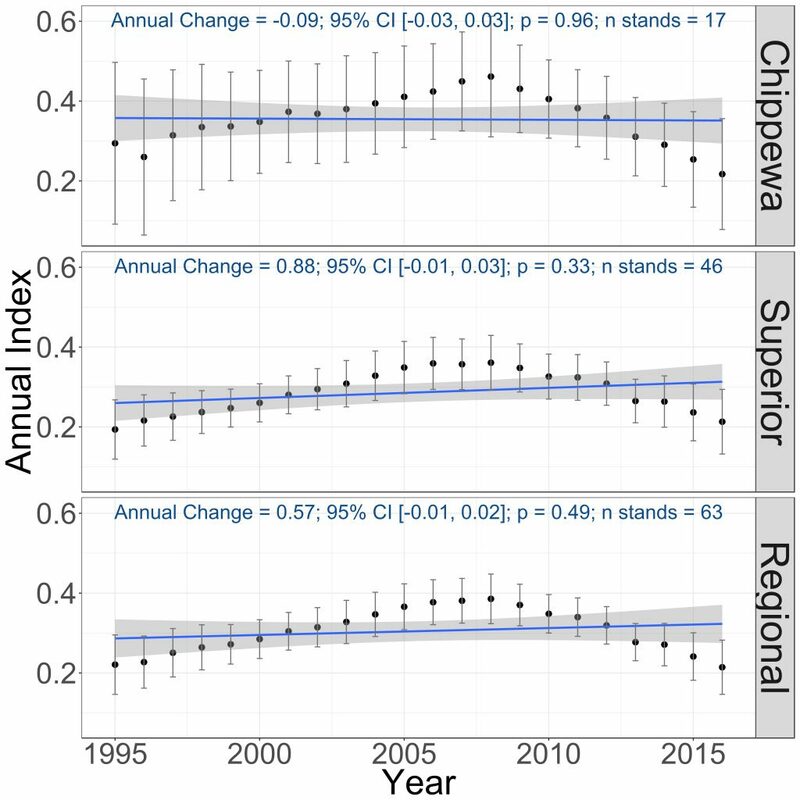 Breeding population trends of the Canada Jay in the Chippewa and Superior National Forests and the combined regional trend, 1995–2016 (Bednar et al. 2016). Canada Jays have been assigned a moderate Continental Concern Score of 9/20, reflecting a minimal concern (Rosenberg et al. 2016). Strickland and Ouellet (2011) emphasized that the primary threat to this species is climate change. They identified three major effects of climate change: (1) the northward advance of the boreal forest, (2) warmer winters in Canada, which have been documented to degrade perishable foods that are stored as boli by Canada Jays to feed nestlings in the early spring (Waite and Strickland 2006), and (3) the irruption of the Rocky Mountain pine beetle (Dendroctonus ponderosae) in western North America, which will increase the open habitat created by the beetle and result in lower densities of trees for the Canada Jay. There is current speculation that the Rocky Mountain pine beetle may move east across the Canadian boreal forest and potentially into Minnesota’s coniferous forests. The Minnesota Department of Natural Resources (2015) did not identify the Canada Jay as a Species in Greatest Conservation Need but included it as a species that requires additional data on its status, distribution and conservation by 2022. Information available in 2014 were deemed insufficient to make this determination. Langham et al. (2015) and the National Audubon Society (2015), in their review of North American bird species susceptible to climate change, does not list the species as a concern. This may be due to the fact that a substantial population already exists in northern regions of Canada and Alaska. Regardless, the Canada Jay may be vulnerable to future climate changes in Minnesota if it’s perishable food (boli), critical to overwinter survival and early-spring feeding of young, cannot be maintained during warmer winter temperatures. Ibarzabal, Jacques, and André Desrochers. 2004. “A Nest Predator’s View of a Managed Forest: Canada Jay (Perisoreus canadensis) Movement Patterns in Response to Forest Edges.” Auk 121: 162–169. Menebroeker, Ryan C., Paula Spaeth Anich, Derek H. Ogle, and Nicholas M. Anich. 2016. “Recent Declines in Canada Jays on Christmas Bird Counts in Northern Wisconsin.” Passenger Pigeon 78: 161–169. Waite, Thomas A., and Dan Strickland. 2006. “Climate Change and the Demographic Demise of a Hoarding Bird Living on the Edge.” Proceedings of the Royal Society of London, Series B: Biological Sciences 273: 2809–2813.